Custom Tournament Charts – Uniquely Designed Blank Brackets Tailored To Your Events. Uniquely Designed Blank Brackets Tailored To Your Events. A JPEG format can be sent to you for under $10.00 in 1 Day. Jaki Designs will deliver a JPEG format with-in 1 day. Let us know your event details and we will implement your personal information into your tournament bracket. Each tournament chart will have the Directors Name, Date, Venue, Event Name and Game Format. 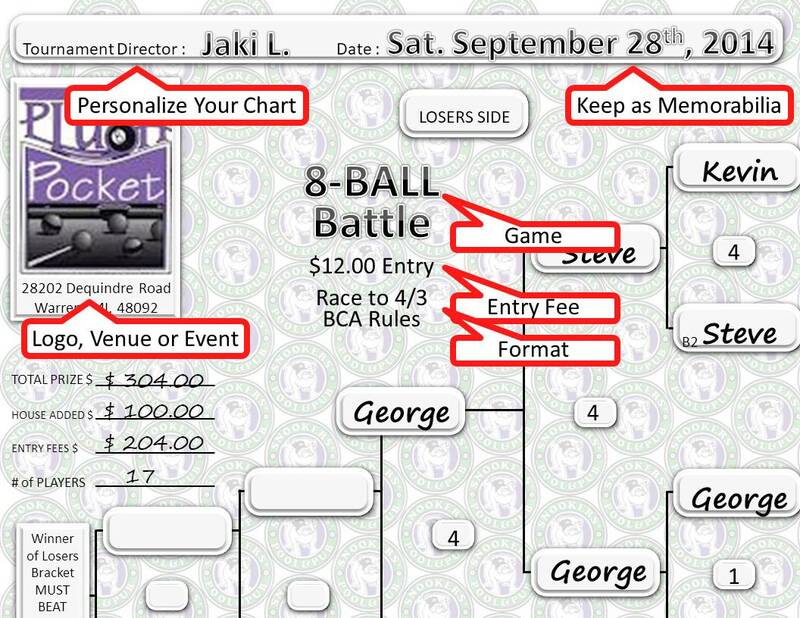 JakiDesigns will create a tournament chart tailored to your event. Each tournament chart will have the Directors Name, Date, Venue, Event Name, Game Time and Game Format. We will be able to digitally deliver your product in a JPEG format with-in 1 day. Jaki Designs wants to help you with the success of your events. Here are some products that are fun because they are tailored to your event. A JPEG format can be sent to you for under $10.00 in 1 Day. Jaki Designs wants to help you with the success of your events. Here are some products that are fun because they are custom. All the tools you need have been configured into this unique design. It has suggestions for bye format, payouts, table markers and on deck matches. These features are on this chart so it will surely help your tournament run smoother. This is what we created and we want to share it with you. Jaki Designs wants to help you with the success of your tournament events. Our blank brackets are tailored to your event. All the tools you need have been configured into this unique design. It has suggestions for bye format, payouts, table markers and on deck matches. This is what we created and we want to share it with you. Full color blank tournament charts can be purchased from this web site. For the minimal price of $6.75 you can have a custom chart with-in 24 hours of receiving your order. We will provide you with a digital graphic in a JPEG format. You in turn, decide your print and production options: paper, laminate, color or blank and white. Enter your event information here.